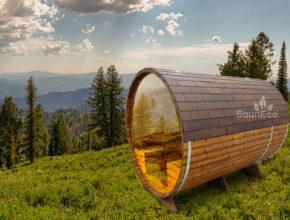 SaunEco is a registered trademark and we are a manufacturing and sales company producing and selling wooden hot tubs, wooden barrel saunas and wooden grill houses-hotels. The core of our company has been around since 2004 and at that time concentrated primary of wood processing and production, but today we export an impressive range of products, by providing high quality, competitive prices and the best service. 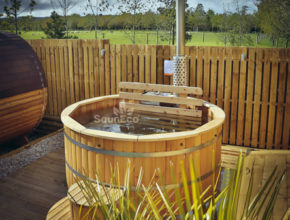 Our main goal is to offer customised hot tubs, barrel saunas, hot tub and sauna accessories and grill houses and hotels. Our experience allows us to provide a full-range of products with meticulous attention to excellence and craftsmanship, down to the last detail of each and every product. Our production facilities are located in Estonia, however, the wood is imported from Siberia or Finland. In colder climates, the wood grows slowly and is therefore much thicker and more resilient than in the warmer climates in Europe. Our customers come from all across Europe such as France, Germany, England, Austria and Switzerland. Since 2009, we have a branch in South Germany, in Baden-Württemberg. Our branch has become very popular over the years – you get answers to all your questions and most importantly – we have always hot tubs and saunas ready in our warehouse. 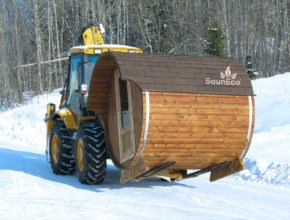 Our customers are welcome to pick-up their ordered goods at our warehouse, where you can convince yourself of the quality, get all the answers and even “test” a hot tub. If that is not an option, we will be glad to deliver ourselves or organize the delivery for you. We are always there for you when you need us and offer friendly service even at late hours. Today we have 23 specialists in our team: 15 in woodworking, 5 in sales department and 3 in logistics. Our long-term experience, skilled workforce, necessary equipment and know-how enable us to produce high quality and beautiful products. Because of our knowledge our helpful staff can answer general questions and even assist in technical related issues. We go the extra mile for our customers; therefore we pay great attention on the quality in order to meet our customer’s needs and expectations regardless how demanding they are. Our goal is to provide top-quality products, the best personal service and comprehensive advice. 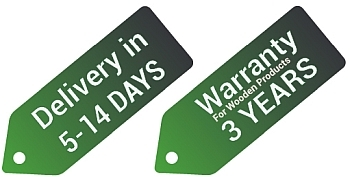 The quality of our products makes it easy for us, we provide a 2-3 year warranty on them. Over the years, a lot of our customers have taken time to share their positive experiences with our products to prove that. We respect your privacy and take protecting it seriously. We will never send spam, sell, distribute or reveal your email address or other personal information without your consent. Our website includes all the necessary safety measures. Your purchase is 100% secure and meets all the stringent requirements in the EU. We offer incredibly short delivery times and your inquiries will be answered in a quick and professional manner.